(TB30DNX) GeoCoins.net Trackable Token Geocoin - Todie's Wild Ride II: Always look! Todie's Wild Ride II: Always look! In the hands of firefighterbill. Use TB30DNX to reference this item. 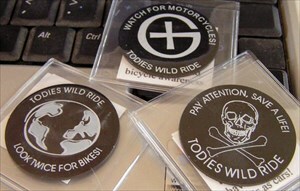 Gallery Images related to Todie's Wild Ride II: Always look! We often cache while biking, and will pass this along on our next trip. Grabbed this coin a couple days ago. Will move along soon. Found this in my caching clothes and decide to log and drop all the same time. Sorry for forgertting to log a few weeks ago.